More than 200 people came to an Albany church April 1 to pay homage to Fred Schroeder, an avid hiker who introduced the Adirondacks to hundreds of underprivileged boys. Schroeder, who lived in an assisted living center in Bethlehem (Albany County) with his wife Martha, died March 18 at the age of 85. Schroeder, a long-time director at several branches of the Albany Boys Club, also directed the group’s Camp Thacher in the nearby Helderbergs every summer until it closed a few years ago. Part of that work included introducing the boys to hikes and camping trips around the nearby woods. And those who excelled at woodscraft were later invited to the Adirondacks. One of those boys was John Antonio, now a retired music teacher living in the Albany suburb of Colonie. “For many of us it was our first encounter with the forest,” said Antonio, who spoke at Schroeder’s memorial service. Antonio’s first Adirondack mountain was Noonmark. 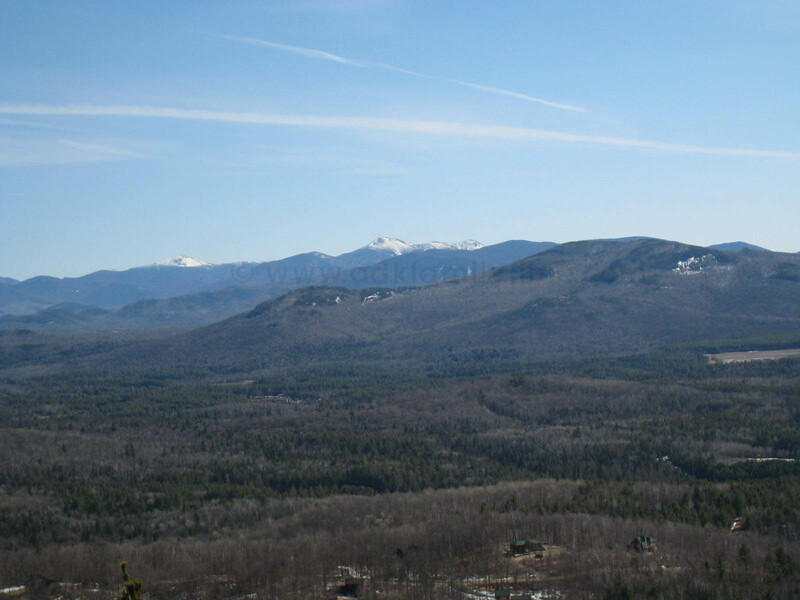 The popular peak in Keene Valley, with its 360-degree view of the Great Range and beyond, was Schroeder’s favorite. Antonio grew up to be a counselor at the camp, and began to lead his own trips to Noonmark and other peaks. Schroeder had very personal reasons for working with city children: he grew up in orphanages in New York City until graduating high school. He also served in Europe during World War II. He was a member of the Adirondack 46ers, the Catskill 3500 Club, the New England 111 Club (whose members must climb all peaks over 4,000 feet in New York and New England). He was active with the Adirondack Mountain Club, the Appalachian Mountain Club, the Taconic Hiking Club, the New York New Jersey Trail Conference, and the Long Path North Hiking Club. He also designed and organized the development and maintenance of miles of hiking trails. In 1998, Fred and his wife provided the funds to build and endow the Emma Treadwell Thacher Nature Center on the grounds of the former Camp Thacher. For the past 30 years, he was an active member of the Albany chapter of the Adirondack Mountain Club, leading weekly hikes to the Adirondacks and every other mountain range within a two-hour drive of Albany. Even later in life , his hiking pace astounded his friends. “When I met him he was in his 60s, and he could hike anything,” said friend Karen Ross. To read more about Schroeder, click here. The Lake George Association will offer a Nuisance Waterfowl Workshop this evening, Wednesday, April 7 at 6:30pm at the Hague Community Center, and again tomorrow, Thursday, April 8 at 6:30 at the LGA office in Lake George. 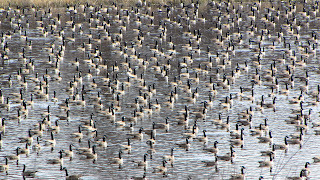 A growing population of Canada geese on the lake is causing significant problems for property owners, with negative impacts for both people and the lake’s sensitive eco-system. Staff from the USDA’s Wildlife Services department will make a presentation and demonstrate techniques, such as egg oiling, that can be used during nesting season to manage the area’s over-population of geese. The workshop is free, and will last approximately one-hour with questions and answers afterward. Reservations are not required. 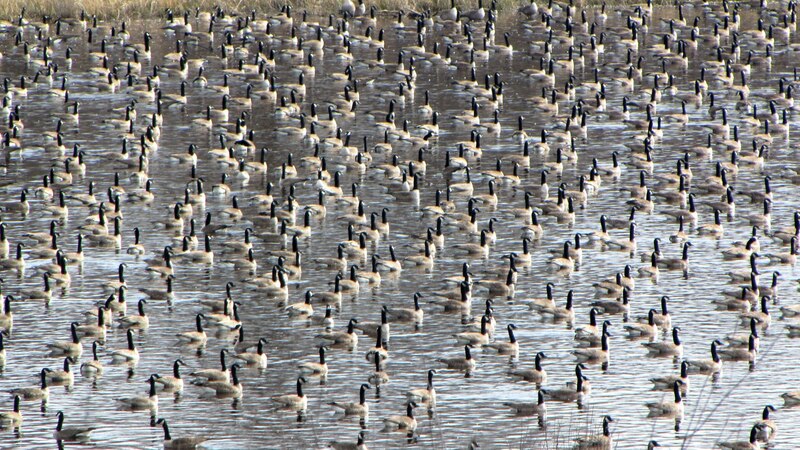 Photo: Canada Geese resting in a pond during spring migration, Ottawa, Ontario (Wikipedia Commons Photo). 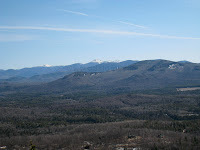 We choose a typical spring day to climb Mount Baker in Saranac Lake. We pack the car with all the enthusiasm of a family caught in the thrall of spring fever. I can hardly keep my children in shoes now that the snow has melted, let alone convince them that putting boots back on after a winter’s worth of wear will be a positive experience. Flip-flops are not an option. I am also able to convince my daughter that rhinestone platform slides are best left at home. Just 2,452′ in elevation, Baker is often referred to as a little mountain. For locals, it’s a quick hike during a lunch break while for others it’s an opportunity to see the High Peaks without investing a lot of time. For children it is a perfect segue to climbing steeper mountains. Springtime in the Adirondacks presents its own unique set of challenges. Sections of the trail are a frustrating combination of sweet springtime freshness and thick mud and ice. Each step threatens to leave us either barefoot (from the mud sucking the shoes right off our feet) or flat on our backs from a misplaced step on ice. Though some people have cramp-ons, we manage to maneuver the path with ski poles and sticks. The summit of Baker is only .9 mile from the base. Since we don’t have cramp-ons we opt to skirt the trail, following other footprints along the edge. It becomes a game of search-and-find for my son. The lower section of the main trail has become a frozen waterfall so he must search across and around it for safe places for us to walk. He willingly takes on the challenge. The path is a gentle incline at first. We then start to see large rocks surrounding us and realize that the summit is near. The path cuts sharply between two boulders but it is too slick for us to approach. We cut back around to the right and climb over the rocks, avoiding the slippery rock chimney. The first vista we find overlooks the town. We identify Lake Flower and the shops surrounding it. The next overlook is behind us, a beautiful view of Scarface and the McIntyre Range. After our well-deserved snack, we descend, but we do not have to choose our steps as carefully. We glissade down the slippery slope, avoiding the mud when we can. There is enough ice that we are able to avoid any damage to the trail. To access Mount Baker, on Main Street in Saranac Lake, turn right onto Dugway. Take the first left, Forest Hill Ave, and continue straight to Moody Pond. The trail marker is on the left. 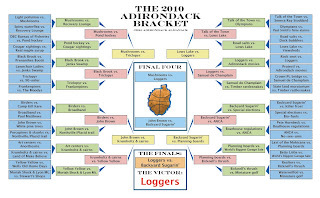 Loggers win the 2010 Adirondack Bracket. The legendary industry that defined life in the Adirondacks during the boom period of American expansion in the late 19th and early 20th century was dominated by that era’s vertically integrated corporate giants like International Paper and Finch, Pruyn & Co. In contrast, today’s landscape is a vast horizontal tangle* of protected lands, timber investment management organizations, environmental regulations, industry mechanization, international tariff wars, and a deep economic recession, set in motion by the swift currents of global economic trade. In this environment, as on the massive log drives one hundred fifty years ago, survival favors the smaller more agile operator: the independent logger. True to the mantra of flexibility, Fahl has, for the past five years, served as forestry consultant to North Country School/Camp Treetops, where he also instructs students in the principles of sustainable forestry. *To place the Adirondack’s in the proper context of global timber/lumber/pulp trade, consider the following comparison:The province of Quebec has 207.3 million acres of timberland, about 120 million acres of that softwood. The entire six million acres within the Adirondack Blue Line—forest and non-forest, public and private—is one twentieth of this fraction of a fraction of Canada’s entire timber reserve. If you subscribe to the Adirondack Explorer, you’re probably familiar with our Brief Bio feature. For each issue, we ask some notable person to answer a list of standard questions. One of them is, What’s your most memorable wildlife experience? I’d like to ask you the same question. If you spend a lot of time in the Adirondacks, you probably have several wildlife stories to tell, so feel free to share more than one. One of my favorite wildlife experiences occurred two summers ago, when I paddled with a friend and his son from Long Lake to Tupper Lake. On the first night, we canoed to a lean-to on the Cold River, where we spent the night in splendid isolation from civilization. The next day we continued our journey down a wild stretch of the Raquette and came upon a female common merganser followed by more than a dozen chicks. Whenever we approached, they would skitter ahead, roiling the water, then settle back into their lazy ways. Finally, they tired of the game and let us pass. Later in the day we arrived at the mile-long carry around Raquette Falls. After finishing the portage, we went to the lower falls for lunch. It was a beautiful afternoon, sunny and warm. As we ate, three mergansers approached the falls. When they got to the brink, they retreated to a little pool out of the current. We watched them, wondering what they would do next. The ducks must have been pondering the same thing. After a minute or so, the bravest re-entered the current, followed by the others. 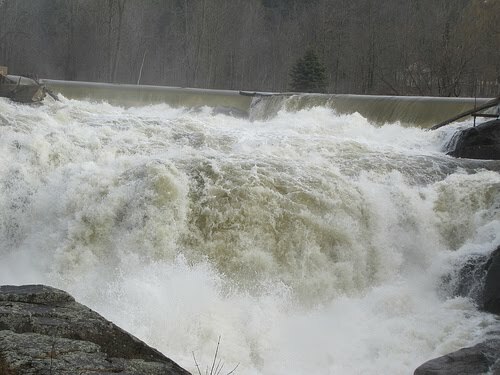 One by one, they plunged over the falls, disappeared beneath the foam, and popped up like corks a few yards downstream. They then continued their merry way, bobbing through the rapids and out of sight. It was a sudden—and surprising—solution to the ducks’ dilemma. And it cracked us up. I have some other stories I could tell, but I’d like to hear yours. Photo of female merganser from Wikipedia. 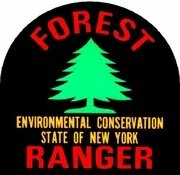 What follows is the Forest Ranger Activity Report for February 6 through March 21 for DEC Region 5, which includes most of the Adirondack region. These reports are issued periodically by the DEC and printed here at the Almanack in their entirety. They are organized by county, and date. At noon on Saturday February 27, 2010, an avalanche occurred on a slide on the northeast side of Wright Peak. The two skiers that triggered the slide were partially buried in the avalanche but were able to rescue themselves. » Continue Reading. New York’s congressional delegation ranks sixth in the nation for its votes on key clean energy and environmental legislation according to the the national League of Conservations Voters’ 2009 National Environmental Scorecard. 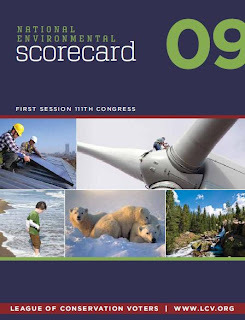 For 30 years, the National Environmental Scorecard has been used to rate members of Congress on environmental, public health and energy issues. The 2009 Scorecard includes 11 Senate and 13 House votes dominated by clean energy and climate but also encompassing other environmental issues such as public lands, water and wildlife conservation. In New York, 20 House members and both senators earned a perfect 100 percent score in 2009 – more than two thirds of the delegation. U.S. Rep. Chris Lee, representing the 26th District in Western New York, had the lowest score in the state, at 14 percent. New York’s average House score was 88 percent, up from 81 percent last year. New York’s average House score ranked sixth in the U.S. Scott Murphy of the 20th Congressional District earned a score of 88; John McHugh (previously of the 23rd CD) scored 67 with his congressional replacement Bill Owens garnering 100 percent so far. The New York delegation scores are as follows. The full 2009 National Environmental Scorecard can be found at www.lcv.org/scorecard. 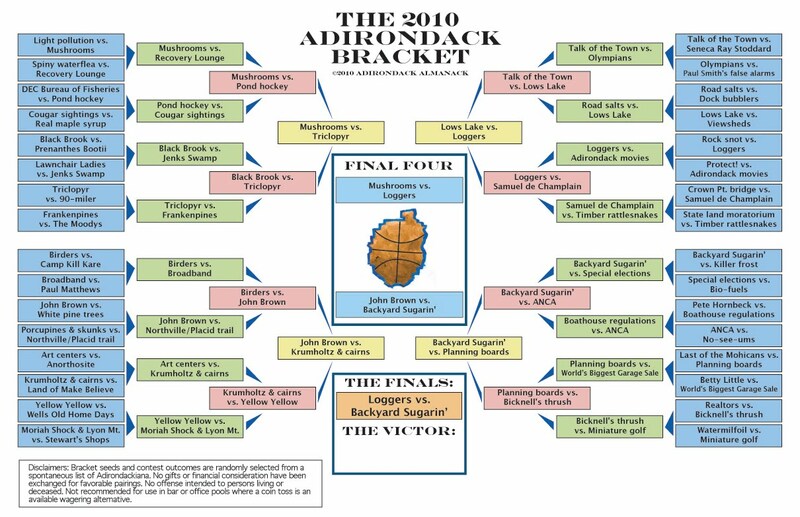 And so the 2010 Adirondack Bracket arrives at the ultimate match, with loggers shrooming their way to a showdown with backyard sugarin’, an upset victor over the moldering remains of John Brown. 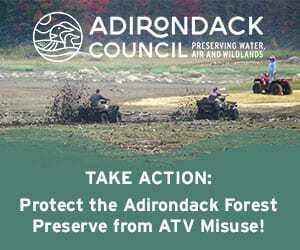 For those unfamiliar with the delicate balance between the iconic Adirondack industry and the constitutional safeguards put in place one hundred sixteen years ago in reaction to some of its worst excesses, this video from PBS offers an excellent primer. And if you have any question as to the fitness of these contestants. . .
As for backyard sugarin’ what more can you say about this tenacious force of nature? Margaret and Forrest Hartley’s stand of a dozen mature trees had a late run, and is expected to produce about two gallons of syrup (from 80 gallons of sap) before the trees bud and the sap turns bitter. It’s springtime! While it’s still a bit early to be paddling lakes, the rivers have opened up and have been ready to paddle for a few weeks now. Let’s discuss the extent to which snowmelt contributes to being able to paddle rivers in the spring. 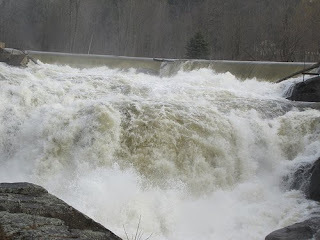 Every year friends and co-workers who know that I’m a paddler ask if I’m excited about this year’s snowmelt and I always give the same answer – Yes, but for the most part it’s not the snowmelt as much as it is the saturated ground and the rainfall. In my years of springtime paddling, it seems to me that most of our snowpack has come and gone before the rivers get high enough to paddle. This is almost certainly the case for the lower elevation rivers and those that have large expanses of wetlands and lakes (think the St. Regis and Saranac). My experience is that snowmelt does relatively little to bring these rivers up. Most of my runs on these rivers occur after decent rainfalls. The snowmelt saturates the lands around the rivers and the trees do not yet have their leaves. This results in a lot more of the rain winding up in the river itself. It’s not uncommon for a relatively small amount of rain (say a half-inch) to bring up a river in April. However, if you’re paddling the same river in mid-May, after the ground has dried and the leaves are out, it may take double or triple the amount of rain to result in a paddleable level. The exceptions to this rule of thumb are the rivers that drain high, steep mountainsides—think the Ausable. For one, the high mountain snowpack is more substantial than that at lower elevations, so it extends later into the season. Also, there is more of a tendency for the meltwater to course down over rocky shelves, which don’t soak up water. Streams draining the higher mountains are sometimes not paddleable early in the morning but can become so later in the day, especially when it’s warm and sunny. You can often see this on graphs of gauge readings. I planned on writing on this topic a while ago. However, I’ve noticed that this spring I’m paddling more on snowmelt than in most other years — that’s the problem with generalizations. I guess the river gods just wanted to make their point. How can the ecology of the Adirondacks better inform the ways we grow food and make our homes here? 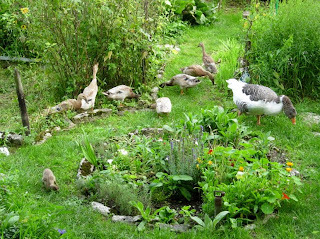 On Saturday, May 8th, 2010, from 10am until 5pm, join professional ecological designer and educator Keith Morris for a day-long exploration of the potential for permaculture design to contribute to ecological regeneration and greater food security in the Adirondack region. 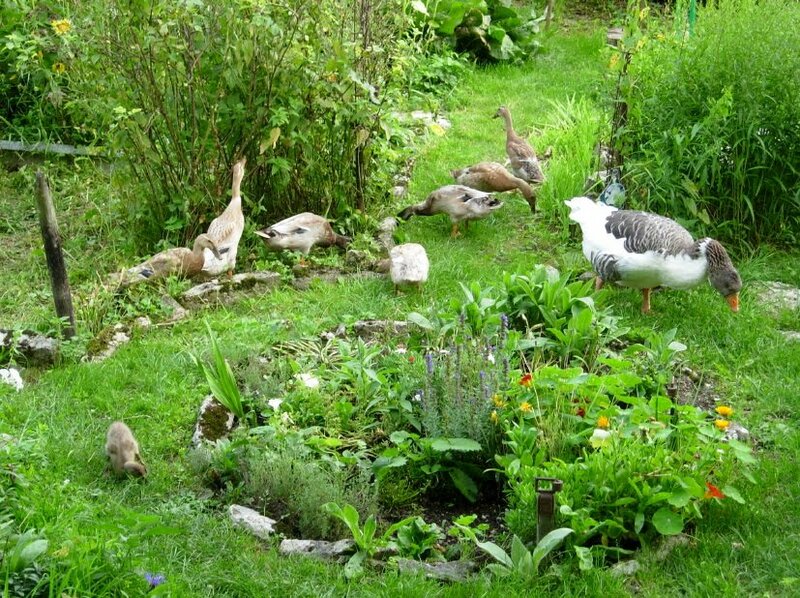 This workshop will introduce a process for analysis and assessment of sites, and provide guidance for good ecological design practice that can be directly applied to your home, farm, or lawn. Participants will learn how to consciously apply the principles of ecology to the design of gardens that mimic forest ecosystem structure and function but grow food, fuel, fiber, fodder, fertilizer, ‘farmaceuticals’, and fun. The afternoon will be spent in a hands-on application of forest gardening technique with fruits, nuts, berries, and other under-acknowledged multi-purpose plants suitable to the northern Adirondacks as we plan and plant the next phases of a demonstration garden on Paul Smith’s campus. Keith Morris is a designer, educator, organic farmer, and natural builder who facilitates healthy and healing human ecosystems. His work combines community building, ecological restoration, integrated structures, and diverse, nutrient-dense food production into beautiful and productive whole systems: farms, homes, homesteads, yards, and regional foodsheds. He is Permaculture Instructor on the faculties of the University of Vermont, Sterling College, Paul Smith’s College, the Yestermorrow Design Build School, and has worked for USAID ‘Farmer to Farmer’ in Nigeria and Ghana. The program will be at Paul Smith’s College. The cost for the program is $25. Lunch is not included, but can be purchased at campus dining on the day. You should bring a notebook, gloves and a bag lunch, if you don’t wish to purchase one on campus. Registration is required. The deadline for registration is April 24th. Please contact Tom Huber, Director – TRiO Student Support, thuber@paulsmiths.edu or call (518) 327-6330. It is the moment for which many fans of random attrition, aleatory contraction, exponential decay and half-lives have been waiting: the rollout of the 2010 Adirondack Bracket Final Four. The victor of the upper left division, those asexxy darlings of deliquescence, mushrooms, will take on the sunderers of silvic virtue, our arboreal bunyons, fellers of the upper right division, loggers. 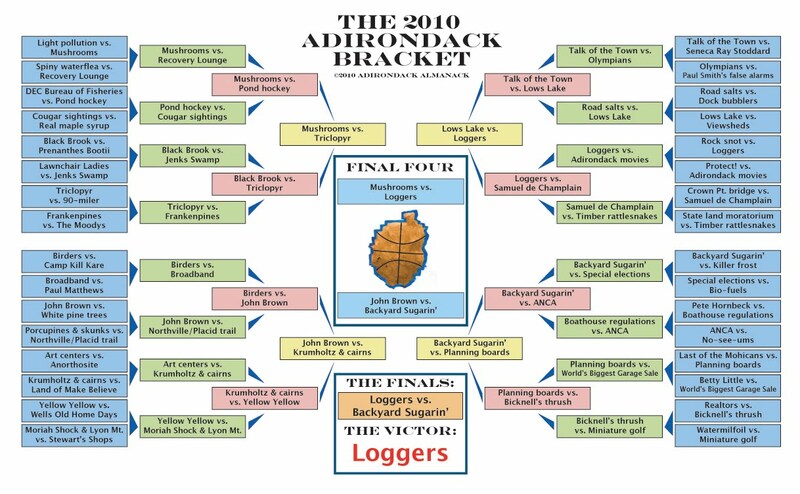 Of note to tournament followers and grammarians: loggers advanced to the tournament’s semifinal round following the official disqualification of Low’s Lake for fielding an ineligible punctuation mark. The lower left division has been dominated from the start by Old Osawatomie Brown (whose 20 offspring could fill an entire final four lineup). For the best rundown on arguably the Adirondacks’ most historic permanent resident (it’s where you’re buried and not where you were born that counts), Almanack editor John Warren’s 16-part series on the last days of John Brown may be found here. Brown will face off against the surprise underdog finalist, Backyard Sugarin’ (punctuation mark, though cheesy, has been deemed eligible by tournament officials). 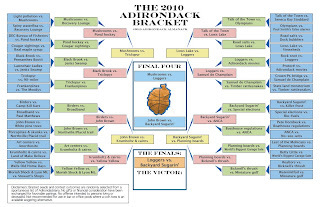 Easily the best accounts of turning your sap into our region’s trademark sweetener come from southern Adirondack journalists Forrest Hartley, whose New American Gothic column was, until recently, one of the best features of the Glens Falls Post-Star, second only to the affordable fifty cent price of daily editions. Forrest’s spouse, Margaret edits the Sunday Gazette of Schenectedy, and authors their Greenpoint blog. 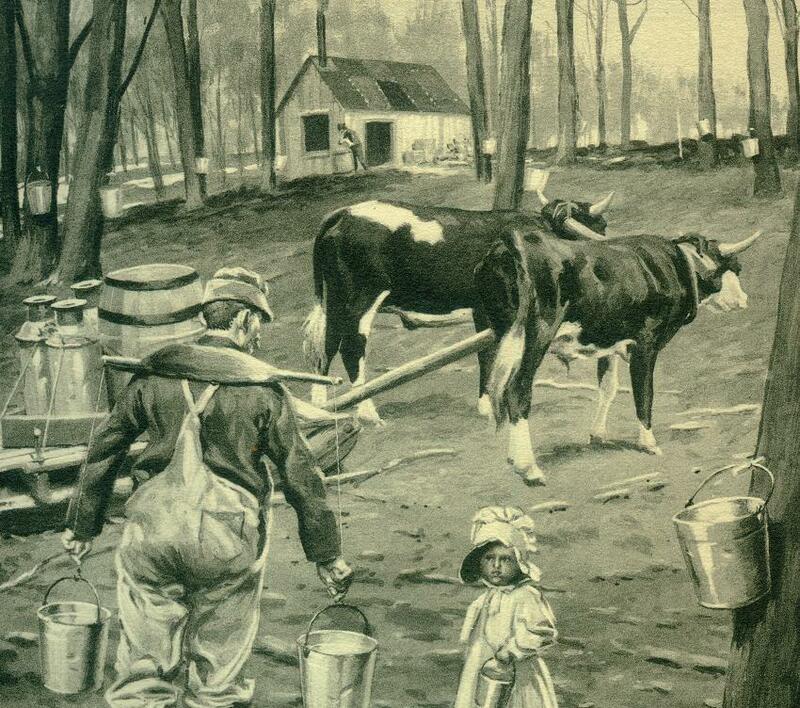 The Adirondack History Center Museum will hold its Maple Sugar Festival on Saturday April 17th from 9:00am – 1:00pm. Part of the Festival includes a Maple Dessert Contest for kids, youth and adults. Entries will be judged by a panel of five locals with expertise in the production and consumption of fine foods. Entries must be made with real maple syrup, preferably New York made. Grade B Amber is suggested for its great maple flavor. Entries will be judged on taste, texture, quality, presentation and serve-ability. The winning creation will be featured for a week at the Deer’s Head Inn. To enter, bring your creation to the Adirondack History Center Museum – top of the hill – in Elizabethtown – by 11:00 AM on Saturday the 17th. Volunteers will fill out your entry form and judging will start at noon. If refrigeration is necessary, please bring the entry in a cooler. For more information, call the Adirondack History Center Museum at 873-6466 or email echs@adkhistorycenter.org. The museum is located at 7590 Court Street, Elizabethtown, NY 12932. One of the popular features along the Rich Lake Trail is our glacial erratic, an enormous boulder left behind by the glaciers over 10,000 years ago. Kids love it because it is huge and easily accessible. Adults love it because it is huge and impressive. Naturalists love it because it is covered with wonderful plant communities, each occupying a niche that meets its specialized needs. For example, on the western face of the rock there are assorted mosses and liverworts. On the top of the rock, looking rather like a crewcut, is a healthy population of polypody ferns and even a small balsam fir seedling. But along the shady eastern face, ah, one encounters these crazy flat, flappy growths of significant size: rock tripe. Rock tripe are a kind of lichen, and there are many species of rock tripe around the world. The species that graces our glacial erratic is Umbilicaria mammulata, the smooth rock tripe. Probably the most common rock tripe in the northeast, it can reach diameters upwards of 30 cm – this is a lichen of some significance. Let’s start our investigation of smooth rock tripe with a look at the name. According to most sources, the English name “rock tripe” comes to us via France, where it is called tripe de roche, literally “rock guts.” I am not a speaker of the French language, but even I can deduce that roche is rock, which means tripe must translate as gut. Some further digging proved me right, for “tripe” is the word used to describe the tissue from the stomach of a ruminant animal (a cow, for example), which is used for food (mmmmm). I grew up with the phrase “tougher than tripe” peppering the family’s lexicon, so I can only imagine that eating real tripe is an exercise in developing the muscles of the jaw. This does not bode well for the edibility of this lichen. Yet, it turns out that rock tripe is indeed edible. Of course, the palatability no doubt depends on the species in question. For example, in many Asian countries, rock tripe is considered a delicacy and is much sought by connoisseurs. On the other hand, the Inuit consider rock tripe to be a starvation food, eaten only as a last resort. 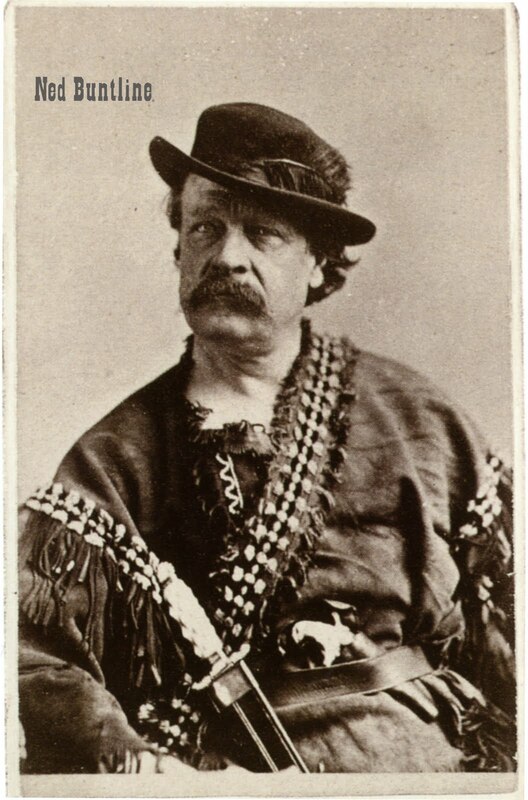 The Cree, however, ate rock tripe as a regular part of the diet, often using it as a thickener for fish broth. Each of these peoples is eating a different species, which one should keep in mind if one is deciding to give rock tripe a try. Reading through the history of the use of this lichen, I’ve come to the conclusion that the description of the Inuit’s rock tripe best fits smooth rock tripe – a starvation food that you’ve got to be pretty desperate to eat. George Washington’s men filled their bellies with it at Valley Forge in the winter of ’77 – they lived, but didn’t thrive. This could be in part because the lichen can act as a purgative. Or it could be because it’s not terribly nutritious – it will fill you up, but your body won’t get much from it. Eating rock tripe is not something to be undertaken lightly. For one thing, it is full of bitter compounds and therefore must be soaked and boiled in several washes of water to render it edible. What is often left is this rather slimy mass. Good for thickening broths. It can be roasted, or fried. Personally, I think I’d have to be pretty darn hungry to give it a try. Let’s revisit the name once more, this time looking at the genus, Umbilicaria. If it looks familiar, it should – think of umbilical cord. See the similarity? Both are derived from the Latin word umbilicus, which means navel – the point at which the umbilical cord attaches. If one takes a close look at rock tripe, one sees that it has a navel, too – right about at its center. It is from this navel that the lichen attaches itself to its rocky home. I love visiting our rock tripe colony at various times throughout the year, because as the weather changes, so does this lichen. When times are good and there is plenty of moisture, the lichen is soft and pliable, like a piece of good leather. In times of drought, it becomes quite brittle, shriveling up a bit and prone to damage. When it’s in this brittle state, it is somewhat less impressive to the casual visitor, but even so, it is worth checking out. If you are checking it out on our glacial erratic, please do not pull it off the rock, for, like all plants and animals at the VIC, it is protected. But once you know what it looks like, you can head out and look for rock tripe on the rocks on your own property. And if you decide to sample it, stop on in and let me know what you thought – starvation food or culinary delight.